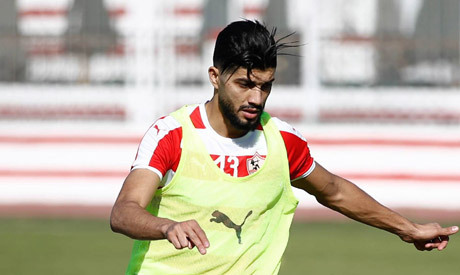 Tunisian defensive midfielder Ferjani Sassi has said he is concentrating on winning titles with Egypt's Zamalek this season after recent rumours about his departure, adding that his dream is to play in Europe after his time with the Cairo giants. The 26-year-old joined the Whites on a three-year contract from Tunisian side Esperance in July. He quickly adapted to the club, making nine league appearances out of 13 and scoring a single goal. "The atmosphere at Zamalek is wonderful. I felt at home, especially with the presence of my countryman [Zamalek defender] Hamdi Nagguez, and that helped me a lot to shine in recent matches," Sassi said in an interview with Al-Ahram Al-Riyadi magazine which was published on Wednesday. Despite recent rumours that he has received offers to leave the Cairo club, he said that winning trophies with Zamalek is his priority for the time being. "I am fully concentrating on delivering an outstanding season and winning a number of titles with Zamalek, especially as the club’s fans deserve that," the former player with Tunisia's Sfaxien and Saudi Arabia's Al-Nasr explained. "The management also provided the needed support to achieve success, besides the fact that we already have a wonderful group of players. "Let's wait and see what will happen when the season ends. My dream is to play in Europe through Zamalek," concluded the player who previously played for French club Metz in the 2015/2016 season. After 13 matches, Zamalek currently lead the Egyptian Premier League table with 32 points, 6 points behind second-placed Pyramids FC. (For more sports news and updates, follow Ahram Online Sports on Twitter at @AO_Sports and on Facebook at AhramOnlineSports.